Range up to 150 ft. or 250 ft. Accuracy of ±1/16" at 100 ft. The Johnson Laser Precision Level measures level or plumb using the precision level vial or two plumb vials that are built in and factory set. Ideal for site layouts, crosscut measurements, slope, conveyors and grade and transit work. It features industrial grade optics that are fully coated for maximum performance. It has no set screws optical calibration and no field adjustments are required with its factory calibrated wedge prisms. It comes with an accuracy of ±1/16" at 100 feet, with a range of up to 150 feet for Red beam and 250 feet for the Green beam variation. The recessed level vials are easy to read but well protected and a working edge is machined flat to 0.005". It won’t bend or twist and it's weather protected with its solid aluminum frame and one-piece design. The solid end caps of this Johnson Laser Precision Level ensure years of trouble free service. The 1/4" - 20 thread mounting hole can be mounted to standard camera tripods for stand-alone operation. Turn the laser on by turning the battery cap switch, to reference the bottom of the level mark the center of the laser dot and subtract 1/2". The Johnson Laser Precision Level includes two CR123A lithium photo batteries and instruction manual with warranty card. The battery can last up to 30 hours of continuous operation. It also comes with a 1-year warranty. 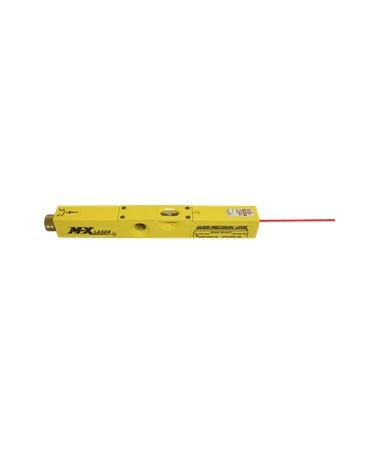 The Johnson Laser Precision Level is available in different beam colors. Select your preference from the drop-down menu above. Plumb Accuracy 5 minute accurate to +/-1/8"/100ft., 30 minute accurate to +/-1/4"/20ft.